H&M have released a new lookbook dedicated to summer tailoring. The collection shuns trends to provide a variety of timeless tailoring in modern, slim cuts that creates a set of looks that are smoother than a Stella advert. With the whole range priced at under £100, this collection lets those on a tight budget take the opportunity to indulge in some tailored sophistication. The sharpest look comes in the form of a tailored black suit paired with a white shirt and slim tie. Kept simple, it is a smart option that will look good on anyone. If that is a little too Reservoir Dogs for you, there are similarly formal looks in grey and navy, which are both paired with pale blue shirts and dark ties. While the looks mentioned provide clean elegance, these suits provide a solid base for the outgoing gent to accessorise and express his inner dandy on a budget. 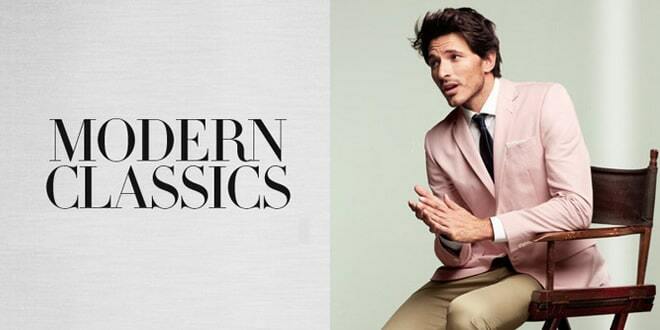 There is also a selection of playful summer suiting in neutral tones. The light grey suit is a versatile piece that can be worn together or as separates. The selection of blazers in light seersucker or pastel pink add a touch of Ivy League eccentricity to the mix, while tan chinos and white tailored trousers provide an alternative to the formal wear that maintains the sophistication of the collection. If you want to relax without letting the sartorial side down, a silk blend polo shirt worn with white trousers gives casual wear a luxurious edge. Overall, H&M’s Modern Classics collection gives you the opportunity to grab something smart and refined, on a modest budget. Whilst not exactly pushing the boundaries of menswear, the lookbook showcases how even the simplest of outfits can be effective when properly put together and worn with confidence. This collection has a lot of richness in terms of colour and well tailored clazers and trousers.